Have you heard statements such as “Do what you love and the money will follow” or “Be passionate and you will be successful” ? I think they are misleading. Not because they are not true, but because they are only a third of the truth. Do something you are good at – You might love lots of things but not be terribly good at them. Lots of psychological research over the last 20 years has shown that we are happiest and most motivated when we are doing something we feel we are good at. So since you are going to be spending a lot of time working on it, you might as well swing the odds of satisfaction in your favour – pick something you are good at. I also think there is also a fourth thing you need, that is, the skills to start and run a business. Just because you love creating web apps, are good at it and there is a market for it, doesn’t mean that you will have a successful business doing it. There are skills you will need to make it work such as evaluating your opportunity, finding the right business model, marketing, financing and many more. What do you think? Join in the conversation in the comments. I would say, Start with what you have on hand, what seems possible to do, no matter how tiny it may seem. Do not try to figure how it is going to expand. Seed does not know how it is going to be a flower. It just open itself and becomes flower. Be open to opportunity. Keep looking, keep pushing. There is much wisdom in what you have to say Mehul. I like to combine your approach with strategy, research and critical thinking. Using the two give me a good basis for decision making I think. I completely agree Susan, especially about research. By conducting in-depth research into your business idea and target market can help to strengthen any business and marketing strategy. Great read! 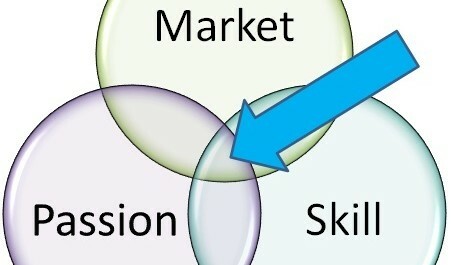 I believe a lot of companies struggle to “hit the sweet spot” that you demonstrate in your diagram. Great posts! 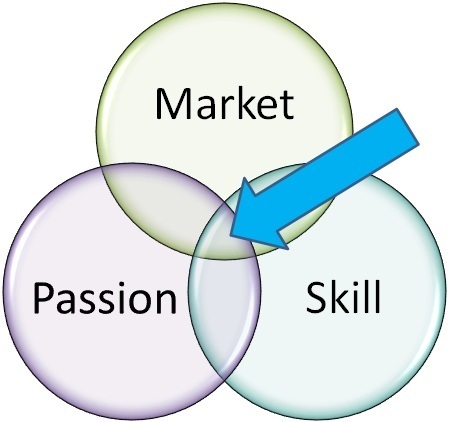 The region halfway between passion and market could be named: “Scratch Your Own Itch”. For me, it is by far the most important element in that graph. If you use your own product and are developing features for yourself, chances are others will be willing to use and pay for said product. In the past, I have started companies building software tools for other people/professions (medical, law enforcement, gaming) and it didn’t work that well. Using my own product makes me more critical (bad — project takes longer) bu also makes me more focused on a finite set of features (good — product is simple & easy to explain). Obviously, it works better when you have other passions outside of building the business itself.